A team of researchers from four American universities says the key to reducing harmful greenhouse gases (GHG) in the short term is more likely to be found on the dinner plate than at the gas pump. The team, headed by Loma Linda University (LLU) researcher Helen Harwatt, PhD, suggests that one simple change in American eating habits would have a large impact on the environment: if Americans would eat beans instead of beef, the United States would immediately realize approximately 50 to 75 percent of its GHG reduction targets for the year 2020. The researchers explained that beef cattle are the most GHG-intensive food to produce and that the production of legumes (beans, peas, etc.) results in one-fortieth the amount of GHGs as beef. "Given the novelty, we would expect that the study will be useful in demonstrating just how much of an impact changes in food production can make and increase the utility of such options in climate-change policy," Harwatt said. In a 10-page paper released May 12, Harwatt and her colleagues noted that dietary alteration for climate change mitigation is currently a hot topic among policymakers, academics and members of society at large. 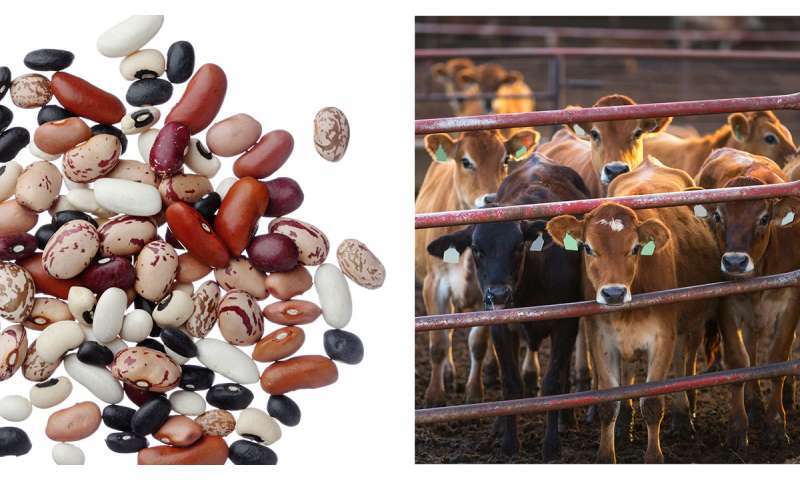 The paper, titled "Substituting beans for beef as a contribution towards U.S. climate change targets," can be found online. In addition to reducing GHG, Harwatt and her team—which included Joan Sabate, MD, DrPH; Gidon Eshel, PhD; the late Sam Soret, PhD; and William Ripple, PhD—concluded that shifting from animal-sourced to plant-sourced foods could help avert global temperature rise. Sabate, who serves as executive director of the Center for Nutrition, Healthy Lifestyle and Disease Prevention at LLU School of Public Health, said the findings are substantial. "The nation could achieve more than half of its GHG reduction goals without imposing any new standards on automobiles or manufacturing," Sabate said. The study, which was conducted while Harwatt was an environmental nutrition research fellow at Loma Linda University, also found that beef production is an inefficient use of agricultural land. Substituting beans for beef would free up 42 percent of U.S. cropland currently under cultivation—a total of 1.65 million square kilometers or more than 400 million square acres, which is approximately 1.6 times the size of the state of California. Harwatt applauds the fact that more than a third of American consumers are currently purchasing meat analogs: plant-based products that resemble animal foods in taste and texture. She says the trend suggests that animal-sourced meat is no longer a necessity. "Given the scale of greenhouse gas reductions needed to avoid the worst impacts of climate change, are we prepared to eat beef analogs that look and taste like beef, but have a much lower climate impact?" she asks. "It looks like we'll need to do this. The scale of the reductions in greenhouse gas emissions needed doesn't allow us the luxury of 'business as usual' eating patterns." "Are we prepared to eat beef analogs that look and taste like beef, but have a much lower climate impact?"? Well yeah, sure thing. But certainly not if you have to pay double to get it. I'd rather spend some money on the suggested beans and, sometimes, meat than analogs. The war against animal fats continues. Nothing has killed more people in the US than the carbohydrate rich government food pyramid. "Heart Healthy" has been corrupted to mean low fat high carb. This is a anti-meat political movement. Forget it. The world is not going to give up beef. So find another silly thing to research.